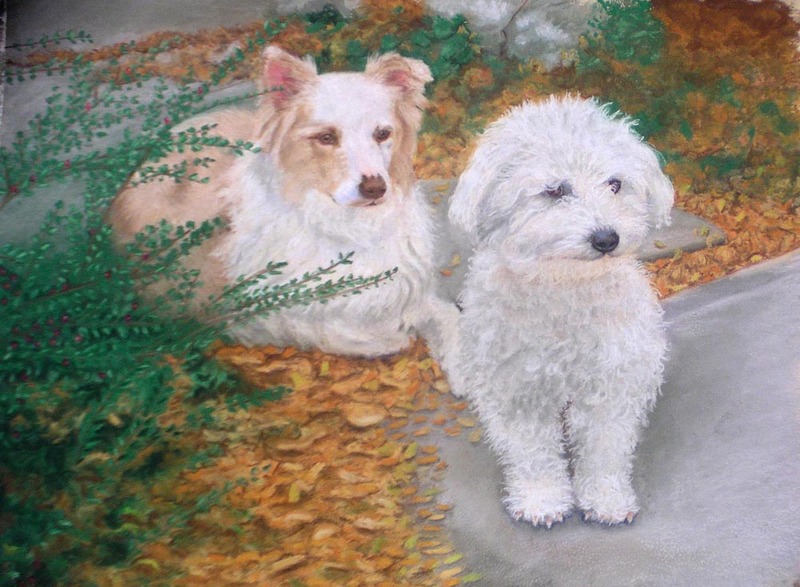 And even though I specialize in animals, I also paint people, and several times have painted portraits of people and their pets. I only have a few samples because some customers have requested privacy when the subjects were children and others haven’t given permission to be on the internet. Christie on her warm towel. Prices are quoted per job, and include only the drawing (no mat or framing; this is extra, see below). Portraits start at $125.00 per subject for a color 8″ x 10″; prices increase according to size and complexity of work. Adding a background, extra objects (toys, etc.) and additional subjects are extra according to their complexity. I reserve the right to limit the content according to the finished size so that the subjects don’t become so small that details are impossible. And remember, I can only do so much with some photographs! Framing is charged as a separate item, and we can discuss the framing when you contract for your portrait. Sophie and Ellie, being good. Animal artwork is not limited to pictures of your own pets, but may include pictures of any sort—wildlife images, for instance. In addition to portraits of your pets, I also offer portraits of your people, your house, or any other item of which you may want a portrait. I can always hold on to a portrait until a holiday, birthday or other event arrives, and I can keep a secret if the portrait is a gift. Your purchase of a certificate supports many shelters and animal welfare organizations because I also donate at least a half dozen certificates to benefit auctions every year where all proceeds of the sale go directly to the organization; your purchase helps me cover the costs of creating original art for the winners of these certificates. I’m always pleased to see they auction for more than their face value—in this way, I can “give” more to the organizations than I ever could in cash. You can read more about custom commissioned portraits on this site by clicking the tab at the top for Commissioned Pet Portraits and from there follow the links to my website, or visit Portrait Demonstration on my website to see how I put a portrait together. To go directly to the Gift Certificate on my website, click here, or go to my Portraits of Animals shop on Etsy. That is a super idea. It sure would make a great present for someone. Wish I had the money to do that for someone. It would be so much fun to do. Better start saving my green papers.